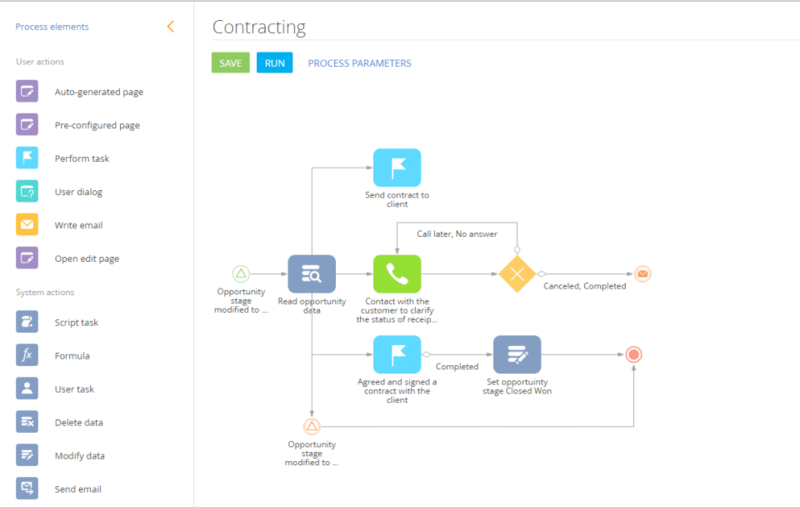 What is bpm’online CRM ? Bpm’online provides a platform for handling all customer related functions to all types of businesses. It aims at delivering end-to-end processes from converting a lead to a sale to handling their after-sales queries. With bpm’online CRM, you can build and change business processes easily by minimising the involvement of IT using its low-coding technologies. It allows you with an opportunity to keep pace with the dynamic business environment with continuous tests to modify and improve processes. Integrate all stages of marketing, sales and service on a single platform with excellent tools and features to ensure healthy functioning of your CRM processes. How much does bpm’online CRM cost ? 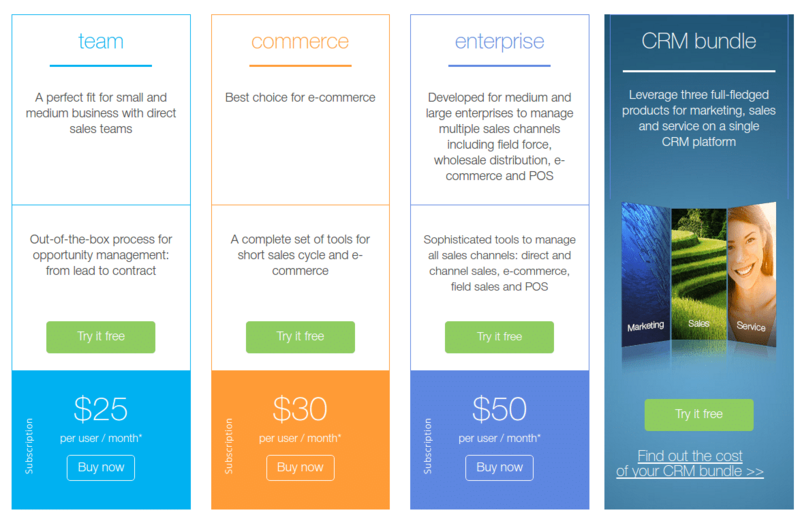 The pricing for bpm’online CRM starts at $25.0 per user per month. 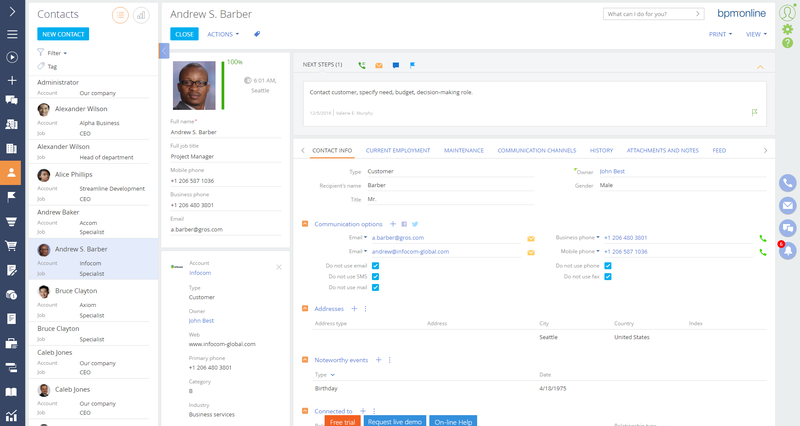 bpm’online CRM has 6 different plans such as - Team Edition at $25.0 per user per month, Commerce at $30.0 per user per month, Customer Center Service at $35.0 per user per month, Enterprise at $50.0 per user per month, User License at $850.0 per user and Service Enterprise at $850.0 per user. "Good CRM for printing industry"
In the beginning, we were using another system. Even though initially that software satisfied our needs, with time we have noticed that it lacks some critical features that are necessary for our business sector. That is why we decided to switch to another CRM with advanced sales and marketing capabilities. What we were looking for is a system that will automate notifications of order statuses and provide analytics that would allow us to effectively respond to customer behavior. We decided to implement bpm’online since it promised to streamline our order processing and thereby increase sales. Our final decision was to implement bpm’online sales commerce and bpm’online marketing products. As for now, everything works fine, but as they say, there is always room for improvement. We look forward to new sales and marketing features from bpm’online. Bpm’online allows us to attract new customers and maintain the interest of the existing ones – that is important for our company. Behavior tracking tool allows us to track visitor behavior on our website as well as identify lead generation channels and sources. All information is collected in the lead profiles and is displayed in dashboard analytics. Now, we can easily track lead sources, evaluate the effectiveness of lead generation channels used in our marketing campaigns, and focus our efforts on the best performing channels. Overall, bpm’online implementation allowed us to increase sales by 20%! That is a huge difference comparing to what we’ve had before. The software enabled us to improve the quality of customer service and increase customer loyalty. Now, we regularly use the analytics that allows us to segment customers according to their behavior and target communications. "Bpm’online - investment that pays off"
The best part about bpm’online is that it provides us with a unified environment where we can process all the vital information. Our employees can easily interact with customers, schedule events and conduct marketing activities. By the way, we made a choice in favor of two products - bpm’online sales and bpm’online marketing. Bpm’online helps us to obtain more customers – the system helps us to understand their needs faster. Creating effective marketing campaigns became much easier as well. By having a complete picture of our business school, it’s easier for us to develop an effective strategy for its further improvement. Support team can be slow at times. Nevertheless, I should give those technical specialists a credit – they explain everything clearly and answer all my questions, even the trickiest ones. A couple of months after bpm’online implementation we have noticed significant changes. And those changes were definitely positive. The best part about the system is that now our school can use sales and marketing tools in a single IT ecosystem, which is really awesome! 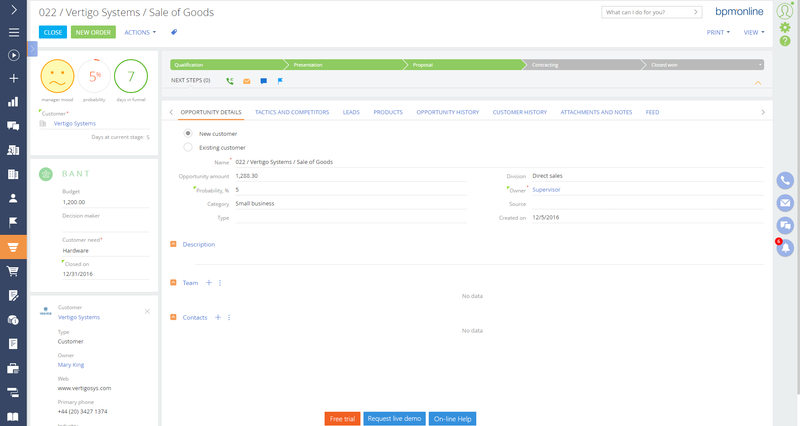 Order history section contains all the important information about transactions and customer needs, as well as sources of those needs and other marketing information. With bpm’online, it’s much easier to maintain long sales cycle as well as streamline lead processing. Bpm’online encouraged us to build first-class marketing campaigns – this allows us to attract new customers and increase the loyalty of the existing ones. Shorty put, we are happy with this CRM and planning to keep using it further. There are many good qualities, but the best is that it is highly customizable. The UI looks and feels great too. There is also a marketplace where you can get packages to add-on functionality or change the experience, which is helpful if you don't have time to make your own solution. Setting up business rules (used to drive behavior on screen) and business processes (automation) can be difficult until you understand how everything works together. If it doesn't look like it has something you need, check the marketplace. We are using BPM'Online to keep track of leads, determine quote prices, and create orders. All of this was done on paper before, and it is really helping streamline the process. We were able to customize it to create separate orders based on location, which really cuts down on our admin. time. Bpmonline is highly configurable and customizable solution that has increased the efficiency and productivity for users. We love the business processes and the automation functionality it offers to eliminate manual work on regular, smaller tasks. 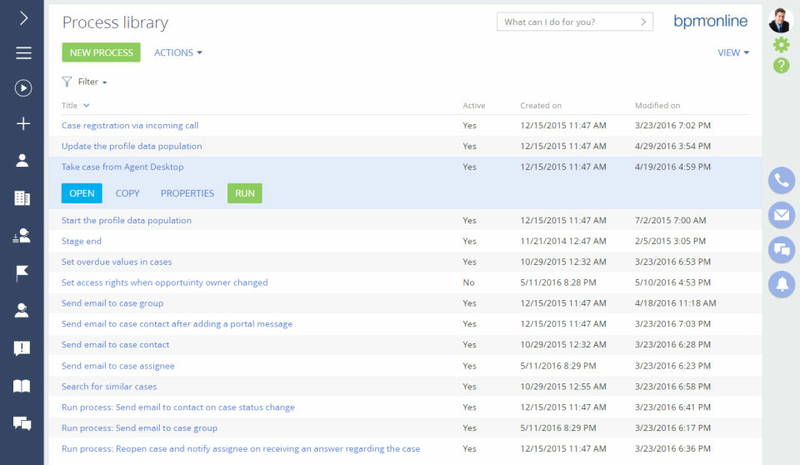 It was great to customize the built-in processes to our specific business needs. Its very User friendly. Data migration through data import was not that difficult either, once we cleaned the data. "Great CRM for exceptional license management and sales process automation"
Prior to the implementation of bpm'online sales enterprise, all work with customer requests was performed in mail client that could not be customized to meet our organization’s needs. 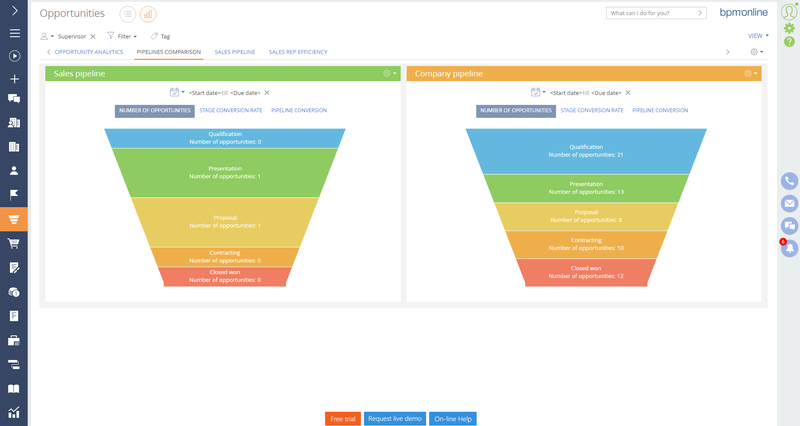 We were looking for a sales automation tool that will provide us with the complete picture of managers’ performance by the means of analytics reports. Finally, we decided on bpm’online sales enterprise. The best thing we like about bpm’online is that it helps us to monitor and maintain our organization’s software licenses. License management in CRM system helps to track them in more effective way now. Utilizing this tool allows us to produce high quality data and provides the added benefit of transparency. We are happy with the system. Like everything about it. Bpm’online implementation enabled our business development department to streamline the process of client licensing. Client access licensing is performed so much faster now! The best part is that with bpm’online our sales reps spend less time on sales closing. Intelligent business processes enable us to configure notifications about license term expiration. In addition, the software allows to automatically generate contracts and documents required to close the deal. License renewal management has been simplified a lot. "Great interface with good tools inside"
All information that I need is in one place. There is no need to store info in different systems, files, any other places, because now everything is well organized and stored in one system. It is rather simple to find and edit info, even when you are out of the office - mobile app is always with me. I like an option to create my personal analytic - it is easy and looks fantastic. There is nothing that I can dislike now. Also rather useful thing is printables - you just enter the info in a system and all the needed drafts of the document are prepared. "Good CRM for logistics companies"
Before bpm’online we used Outlook to handle customer requests. However, with time we discovered that Outlook does not allow us to measure employee performance properly and collect customer data accurately. Also, it always huge problem for clients to duplicate their requests in case of absence their Manager. In addition, reporting has become difficult. We decided to switch to bpm’online CRM. 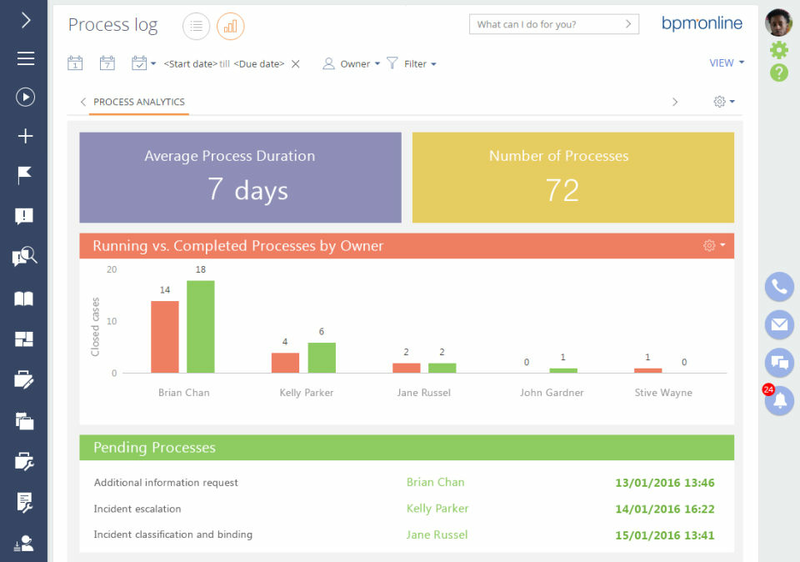 What we like about bpm’online is that it has an intuitive interface and a social look and feel, which makes working with the software easy. Bpm’online CRM allowed us to automate communications with clients and improve collaboration between multiple departments. Can’t think of any disadvantages at the moment, everything is working fine. Bpm’online enabled us to aggregate all the needed information in a single environment. This allows us to monitor and analyze manager performance. Having a 360-degree view of all the customers helps us predict their preferences – it is much easier to win their trust now. And there is no need to ask clients to repeat information they already discussed with other Manager. With bpm’online we can easily measure customer satisfaction. We can communicate with customers directly from the system. This includes making calls, managing email, approving contracts and collaborating in the enterprise social network. Will use this system further. I feel free to customize, starting from modifying an existing module or making it from zero, it's easy just drag and drop, then a system can be build. Bpm in the build system is very fast. Meanwhile, the marketing module is good, especially the analytic email blasting feature. This application is heavy, running program is not fast, very dependent on resources and specifications that are quite large. And for mobile that still need further development. Bpmonline can be the right choice for building a CRM, because bpm has provided a default CRM module that is in accordance with existing standards, and of course it can be customized freely. Bpm very helpful, especially in the marketing section, called the email blasting (bulk email) process to new leads or existing customer. The benefits that I felt were helped by the results of the bulk email analysis, starting from how many customers click, unsubscibed, etc. So that I can plan more directed and targeted promos. "Good CRM for equipment manufacturers "
Earlier we couldn’t manage to analyze the performance of our sales team. As a result, it was hard for us to plan business development strategy. To make things worse – our employees worked with tables. We knew that it was high time to change the way we run our business. We decided to give bpm’online sales a try, and…. it met our expectations! I dislike just one thing – that we didn’t implement bpm’online earlier. With bpm’online we can easily analyze both quantitative and qualitative performance indicators. For example, now we can quickly calculate sales conversion rate and lead value. Recently we’ve discovered that our sales volume increased by 35% after bpm’online sales implementation. We were pleasantly shocked. The system allows us to measure employee productivity performance so that we can properly gauge worker efficiency, identify who is working hard and who isn't. We can now determine how to properly compensate our workforce, and improve our workplace's overall productivity. Good job, bpm’online! This certificate is granted to products that offer a versatile and useful free trial to their customers. We evaluate the quality of options included in a free trial, its limitations and the ability to judge the software itself based on the free trial contents.